Tom Norton scored for Phantoms against Basingstoke. Peterborough Phantoms collected a fourth success of the season over table-toppers Basingstoke last night (February 6) to close to within four points of the English Premier League summit. They may have endured a nightmare start (falling behind inside half-a-minute) and miserable finish (returning to the city to be greeted by a number of parking tickets on their vehicles), but what happened in between to earn a 3-2 success was particularly memorable. Will Weldon scored for Phantoms against Basingstoke. Defenceman Tom Norton settled a high-class contest with a late powerplay winner after Phantoms had twice battled back onto level terms courtesy of Darius Pliskauskas and Will Weldon. The latest victory confirms their superiority against Bison in the sides’ six-game regular-season series. It also represents a remarkable turnaround in form after Phantoms lost five of their six clashes with the same opponents last season. 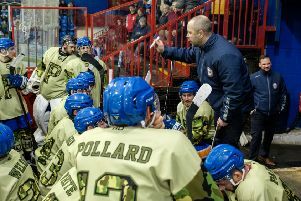 Delighted coach Slava Koulikov said: “Everyone knew the importance of the game and coming away with the two points ranks as a fantastic result. “We showed good character to twice come back from falling behind before getting the crucial goal late in the game. “Basingstoke are not only the top team in the table, they are also the hardest-working team in the league. “We knew it would be a tough 60 minutes, but we played very well as a team and fully deserved the win. Stuart Mogg fired the hosts ahead after just 29 seconds and they retained their single-goal advantage during the remainder of the opening period. It was wiped out when Pliskauskas struck 89 seconds into the middle stanza, but parity proved to be short-lived with Bison soon back in front courtesy of an Aaron Connolly powerplay effort. Weldon forced a bobbling puck past Basingstoke netminder Jon Baston to claw Phantoms level for a second time in that period. The first-versus-third clash was eventually settled with little more than three-and-a-half minutes to go when Norton found himself free to finish as Phantoms made a numerical advantage pay. Phantoms are on home ice tonight as they entertain lowly Hull (February 7, 5.30pm) in Bretton. The Pirates have been despatched 11-0 and 4-0 in their two previous visits to the city and Koulikov insists another resounding victory is important.